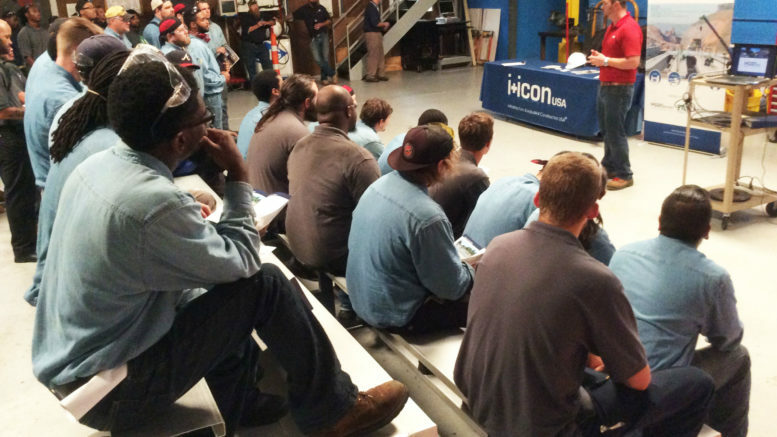 Word continues to spread through the trade industries about the quality of students ATI sends into the workforce. Richard Rueter, President of Power Mechanical, visited ATI’s main campus to speak to the welders and heavy vehicle classes about career placement within their organization. Power Mechanical is a local Hampton Roads company with a national reach. They provide both steam and chilled water services to companies and have been doing it for over 25 years. Most of their work involves the building and maintaining of both boilers and chillers for large manufacturing companies and plants. Following the presentation from Power Mechanical, ATI was visited by Jeremy Thompson, the Fleet Manager for I+ICON Southeast, a brand new division of national infrastructure contractor and construction company I+ICON. I+ICON Southeast is fast putting its stamp on some of the major construction projects in the area, including the expansion of the George Washington Bridge in the City of Portsmouth. I+ICON has a need for welders to work on bridge and infrastructure projects, auto techs to maintain their own personal fleet of vehicles and heavy vehicle/diesel techs to maintain their equipment. They even have a need for HVAC techs to work on the final stages of projects. ATI’s growing reputation for developing highly skilled technicians will ensure its position in the spotlight for those employers seeking to reinforce their work staff.